The Fold-Over version will enclose a pack of about 25 3x5 index cards on four sides. Clip it at the top to keep all of your cards enclosed and covered - safe from damage and hidden from the nosy. The flap is designed so that it stays securely closed, but can be flipped open without squeezing the clip. If you fold it to the back, it will fit under the arm of the closed clip on the back side, giving you full access to the top card and still without squeezing the clip This is a particularly handy way to keep your shopping list visible at hand in the store. All this about not having to open the clip means that you don't have to fiddle with your pen while you're locating a fresh card or crossing something off a list. 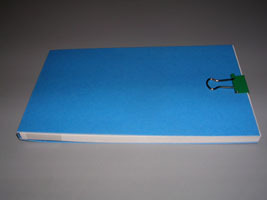 Kit includes 10 Fold-Over Index Card Wallets and 10 small binder clips. Color kits include two each of red, orange, yellow, green and blue. 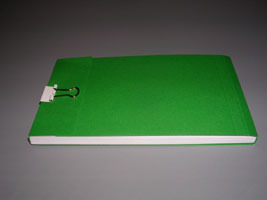 The Open Top version holds a pack of about 25 3x5 index cards on three sides. Clip it at the fold to allow for easy one-handed access - keeping your pen hand free. Clip it at the open end to keep your cards neat and unruffled. Clip it on the side for a little compromise. The heavy card stock is more durable than a naked packet of cards. A full wallet of 3x5 cards disappars comfortably in a pocket. Who doesn't like to color-code things? Oh... You don't? Try the manila ones, then! They're cheap, replacements are available anywhere when you run out, you can use them for anything, they don't break, they still work when you run out of batteries. You can organize and re-organize them into exactly the lists you need when you need them. You can take with you only the ones you need. And a few blank ones for whatever comes up while you're out.